Born in Philadelphia as the son of a ship carpenter, William Rush (1756-1833) was apprenticed as a teenager to a woodcarver named Edward Cutbush. Within three years he surpassed his teacher in skill at carving the much in demand figureheads for ships. Rush opened his own shipcarving business around 1774, and in 1777 he joined the American Revolution with the Philadelphia militia. Following the war, Rush married Martha Simpson Wallace in 1780; they would have ten children, including their son John Rush, who also became a shipcarver. Rush’s carvings were much in demand for merchant ships, and he enjoyed increasing success and notoriety. When the U.S. Navy was created in 1794, it chose Rush to execute figureheads for the frigates, and he skillfully created several subjects, such as Hercules and Liberty. The Embargo Act of 1807 ended the demand for Rush’s ship figureheads. He then turned to creating sculptures on commission for various buildings, including carving one of his most famous works, Allegory of the Schuylkill, for the Philadelphia waterworks. Rush was one of the founders of the Pennsylvania Academy of the Fine Arts, and in 1812 he became a professor and teacher of sculpture there. During this time he also made the important step of beginning to produce busts in terracotta. William Rush is considered the first major American sculptor. Though many of his famous figureheads did not survive, his legacy today remains in his plaster, terracotta, and surviving wood carvings. William Rush (1756 – 1833). 25" x 15" x 11". Library Company of Philadelphia. Source unknown. 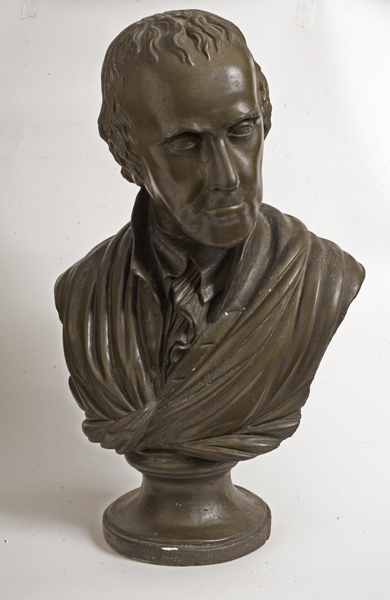 The bust of Dr. Philip Syng Physick (1768-1837) was one of Rush’s earliest forays into sculpture with terracotta. It was part of a series of busts that Rush would create of Philadelphians including soldiers, statesmen, and other influential local figures. Upon completing his first sets of terracotta sculptures, Rush realized the potential for mass production of his pieces through plaster casts, and would work extensively in terracotta. Physick was a physician and teacher born in Philadelphia and is often called the father of American surgery. He was a member of the staff of the Pennsylvania Hospital, as well as chair of surgery at the University of Pennsylvania, where his teachings were influential. He is credited with making many valuable contributions to the field, including the invention of the stomach pump and developing instruments to remove tonsils. 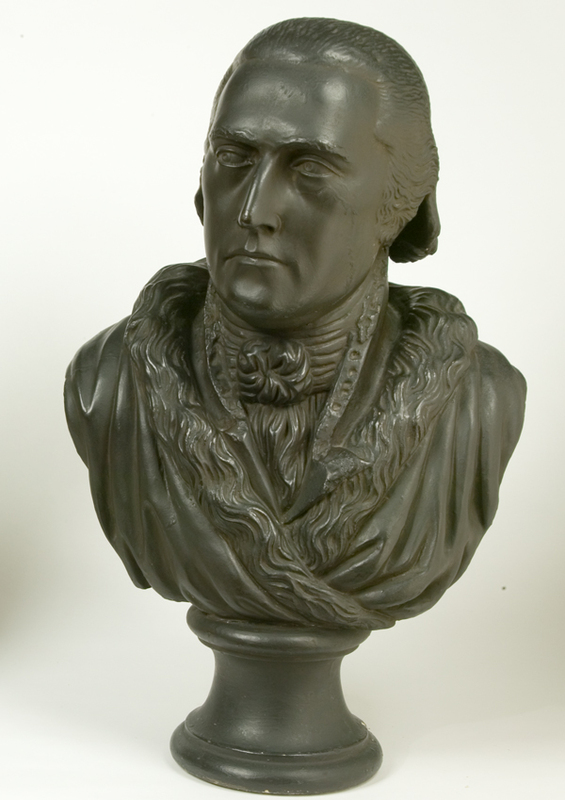 This bust is a wonderful example of Rush’s early transitional works in professional sculpture. Dr. Benjamin Rush (1746-1813) was a physician and professor of chemistry and medicine as well as a social reformer, supporting abolition and temperance. He was also a signer of the Declaration of Independence and a Pennsylvania delegate to the Continental Congress. He briefly served as surgeon general of the Continental Army, but resigned from the position due to disillusionment with the awful and disorganized conditions of army hospitals despite his extensive efforts. He returned to his practice and professorship of medicine. Rush played a major and controversial role in the 1793 yellow fever epidemic in Philadelphia, advocating the disputed therapy of bloodletting. While many physicians fled the city, he tirelessly continued to treat his patients, making him a popular hero. He is credited with some of the first attempts to understand mental illness and is called the father of American psychiatry. Rush was a shareholder in the Library Company. His son, Dr. James Rush, would later bequeath the funds for the Library Company’s Ridgway Building, along with this fine sculpture made by William Rush, Benjamin Rush’s second cousin.